Book Launches, Parties, and Blog Tours, Oh My! January is the launch of my first yoga mystery, Murder Strikes a Pose, and I will be going blog crazy! Through January 20, my Whole Life Yoga and Killer Hobbies blog posts will be devoted to the blog articles and events below. After that, it will be back to articles on yoga tips, research, practices, and techniques, with an occasional writing blog thrown in for good measure. Murder Strikes a pose will be available on Kindle, Nook, Kobo, and other e-readers as early as January 1. It will be available online at Amazon as well as retailers and bookstores everywhere on January 8. You can pre-order any time! Thanks to Great Escapes Virtual Book Tours for sponsoring the blog tour below. Each stop will provide unique content, so don’t miss any. You might just learn some of my deep, dark secrets! A free autographed copy of Murder Strikes a Pose will be given away at each stop! And, for those of you in Seattle, a couple of in-person events. January 25 – Book Signing at Seattle Mystery Bookshop (Saturday, noon – 1:00 PM) DATE CHANGED DUE TO SEAHAWKS PLAYOFFS GAME. GO HAWKS! Hugs and prizes will be available at both events–and at Whole Life Yoga, vegan chocolate mousse cake! I hope to see you there! This entry was posted in dogs, Guest Writers, writing and tagged dogs, Murder Strikes a Pose, yoga mystery on December 30, 2013 by Tracy Weber. After what feels like an eternity, I now have copies of Murder Strikes a Pose! I have to say, I am thrilled. To launch the series’ beginning, I’d like to share the book’s beginning with all of you. Take a look at Chapter 1 and let me know what you think! A series of yelps and the words “I’m calling the cops!” zapped me like a cattle prod. I leapt from my mat and stormed across the floor, determined to put a stop to that infernal racket. I hurled open the door and came face-to-face, or rather face-to-snout, with the source of the commotion. Not more than five feet away from the studio’s entrance stood a paunchy, dark-haired man and the biggest, skinniest, meanest-looking German shepherd I had ever seen. Don’t get me wrong. I like dogs. I love them, in fact. It’s their human counterparts I could sometimes do without. But this frothing breast was no Rin Tin Tin. A long line of drool oozed from its mouth. Its sharp white teeth glinted in the sunlight, and its black wiry topcoat still stood on end from the prior scuffle. The dog was obviously rabid. I didn’t recognize the man standing next to the frightening creature, but I did recognize his activity. He worked as a vendor for Dollars for Change, a well-regarded local newspaper that published articles about homelessness and poverty while employing those same homeless individuals as salespeople. Ordinarily I would have welcomed one of their vendors outside my business. If nothing else, supporting the paper demonstrated yoga’s principles of kindness and compassion. But this was not an ordinary circumstance. I absolutely could not allow that disgusting dog to raise a ruckus outside my studio. The prenatal class would have a fit. Suffice it to say that pregnancy hormones didn’t always leave expecting moms in the best of moods. My moms-to-be liked their yoga practice. They needed their yoga practice. And they needed to be serene while doing it. If a noisy dog fight disturbed their peaceful experience, I’d be the one getting barked at. Coalie was as rude and friendly as Labs everywhere. She couldn’t stop herself if she tried. She ran up to Bella, wiggling her entire body with glee, and covered Bella’s muzzle in sloppy wet puppy kisses. Bella wasted no time. Faster than a 747 and stronger than a freight train, Bella pinned Coalie to the ground between her front legs, snarling and air-snapping on either side of Coalie’s neck. I heard the sound of canine teeth chomping together and imagined soft puppy bones shattering between them. My student screamed. Coalie yelped. George grabbed Bella’s collar while I reached in between razor-sharp teeth to pull Coalie from the jaws of death. The three of us wrestled the two dogs apart, but not before my student almost died of heart failure. He was right. Like all good yoga teachers, I had extensively studied yoga philosophy and tried to live by it. The teachings were clear: A yogi should respond to suffering with active compassion. And George was clearly suffering, whether he realized that fact or not. Threatening to call the cops on George’s dog may have been active, but it wasn’t all that compassionate, to him or to Bella. I felt like a cad. My solution probably wasn’t what the teachings had in mind, but it was the best I could come up with on short notice. He took the money, left the papers, and wandered off, whistling. Bella happily trotted behind him. 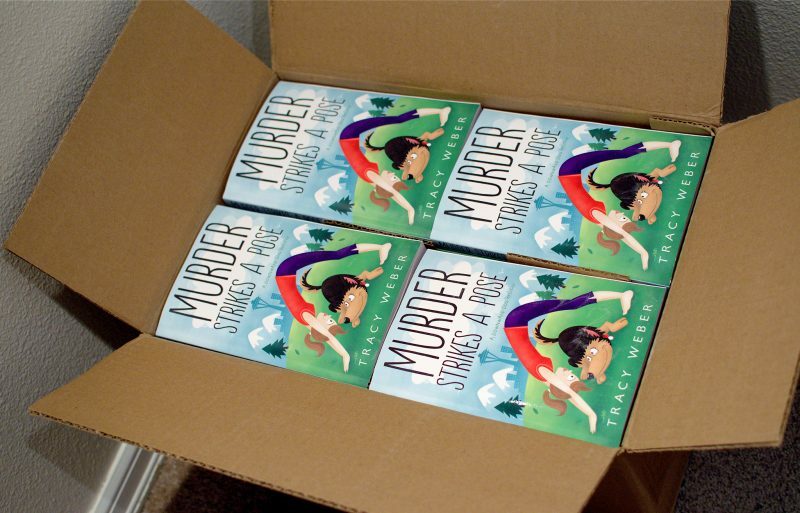 This entry was posted in writing, Yoga Books and tagged first chapter, Murder Strikes a Pose, yoga mystery on December 19, 2013 by Tracy Weber. This week’s blog entry was written by guest author Katie Burns. Katie is a graduate of Whole Life Yoga’s 200 hour yoga teacher training program and a student in our advanced teacher training program. She can be contacted at katie@pacheholistichealth.com. As this holiday season approaches, many of us increase our doing. There are cards to write, gifts to buy, homes to decorate, parties to attend, and many other events and tasks demanding our attention and energy. We participate in many of these activities because we care deeply about the people in our lives, and the holidays present an opportunity to let them know that we love them. We become so busy that some of us begin to cut back in other areas. We sleep fewer hours each night. We run non-stop from work to activity to activity. We buy new underwear because we have three weeks’ worth of dirty laundry in the hamper, and it’s faster to buy new undergarments than to go to the laundry mat. However, this constant state of doing and cutting back our healthy habits may not be the only option for making the holidays special. During my early twenties, I moved to Chicago to volunteer with an inner-city teaching program. After a brief stint of student teaching summer school, come September I quickly found myself with a second grade class of my own. I felt for these new students. They were stuck with me, a brand new teacher who wasn’t sure what she was doing those first few months. To compensate for my lack of experience, I worked hard. I stayed up late and woke up early to grade papers, write lesson plans, and acquire materials for projects since this low-income school had limited resources. I wanted to give my students the best second grade year that I could. I felt exhausted daily, but I believed that it was worth it. Then one night, on a fluke (or likely due to exhaustion), I went to bed early knowing the next day would be a struggle since I wouldn’t be fully prepared. I slept for eight hours that night. When I went to school the next day, I discovered that even though I was less prepared, I felt energized. I was flexible and had more patience with my students. I noticed that my enjoyment in working with these kiddos increased. I was actually a better teacher. It seemed that by taking care of myself, I could roll with the punches and see the joy in the small moments. The rest of the year, I made it a priority to get more sleep. I learned that I needed to let go of doing in order to really be present with my students. As we prepare for the holidays this year, I encourage you to continue the activities that allow you to be present with the ones you love. Go to bed early. Attend that yoga class that you’ve been eyeing. Take ten minutes to meditate even if it involves hiding from your family by staying in the bathroom for a mini-meditation post-shower. By letting go of the “need” to do, you may find that you are more peaceful being around loved ones. This entry was posted in Guest Writers, Teacher Training Graduate Stories on December 16, 2013 by Tracy Weber. Great news for those of you who suffer from seasonal depression or the holiday blues. Researchers at the Boston University School of Medicine recently published a study in the Journal of Alternative and Complementary Medicine that showed that three hours of yoga per week can help combat depression much more effectively than an equivalent amount of other forms of exercise, such as walking. Researchers monitored two groups of healthy individuals for twelve weeks. One group walked for three hours each week; the other practiced an equivalent amount of yoga. Both groups filled out questionnaires about their mental health and underwent magnetic resonance spectroscopic (MRS) imaging to measure levels of the amino acid GABA. GABA is essential to central nervous system functioning and helps promote a state of internal calm. The yoga group reported improved mood and lower levels of anxiety, which were reflected in climbing GABA levels. Yoga participants also showed improvements in strength, endurance, balance and flexibility. Exactly what the ancient teachings have told us all along! This entry was posted in Asana, Yoga Research on December 9, 2013 by Tracy Weber. This week’s blog entry was written by guest author Katie Burns. Katie is a graduate of Whole Life Yoga’s 200 hour yoga teacher training program and a student in our advanced teacher training program. She can be contacted at katieburns09@gmail.com. As we awake from our Thanksgiving food comas, the mind quickly transitions full swing into the holiday season. We know our next Thanksgiving—aka, day of the double Gs: gratitude and gluttony—is a good 350+ days away. Daydreams of gifts we would like to receive enter our conscious space, and brainstorms of presents for those we love occupy our thinking. As we move forward, I invite you to carry the spirit of gratitude from Thanksgiving into your daily life. I invite you to reap these benefits by keeping a gratitude journal for one week. The instructions that the researchers provided for their participants are below. You can follow their suggestion or adapt your gratitude journal to fit you. Regardless of the form that your gratitude journal takes, you are planting the seed to focus on the positive moments in your life. Watch to see how that seed grows, and if you are willing, share your experience by leaving a comment below. Wishing you a happy holiday season filled with gratitude! This entry was posted in Gratitude, Guest Writers, Teacher Training Graduate Stories, Yoga Research on December 2, 2013 by Tracy Weber.